For over a decade, we’ve been providing superfast broadband to areas of Northern Ireland and County Donegal most providers can’t get to. We provide plans for Home and Business, alongside our Enterprise service — bespoke, high capacity internet connections for demanding users. 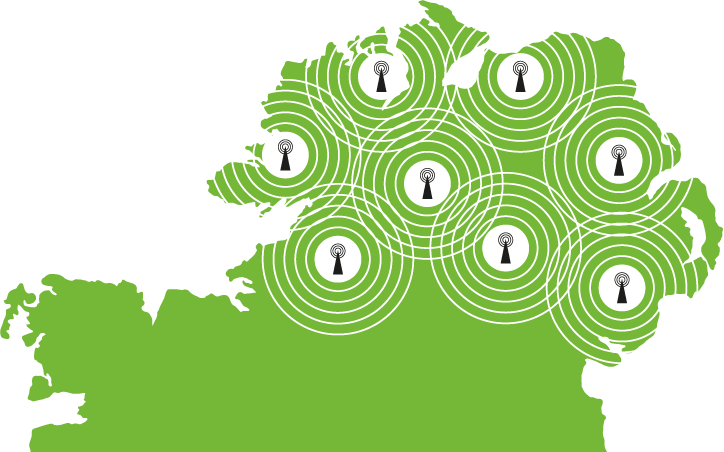 With over 170 broadcast points across Northern Ireland and Donegal, we can provide broadband to 92% of the population. The other eight percent? Don’t worry, we’re working on it. Tired of broadband that doesn’t keep it’s promises? Thanks to our WiMax technology, Bluebox easily outperforms competing services — and no matter how far your home or office is from a broadcast point, Bluebox keeps you up to speed. Bluebox uses WiMAX technology, which operates on the same principles as WiFi — but outdistances WiFi for miles. Using long distance radio signals, Bluebox can broadcast an internet signal directly to your home or business. WiMax doesn’t worry about signal interference the way WiFi does, and is intended to allow higher data rates over longer distances. All of which makes it perfect for delivering quick, reliable internet access to remote locations.